"Show Room Piece" Never Used! 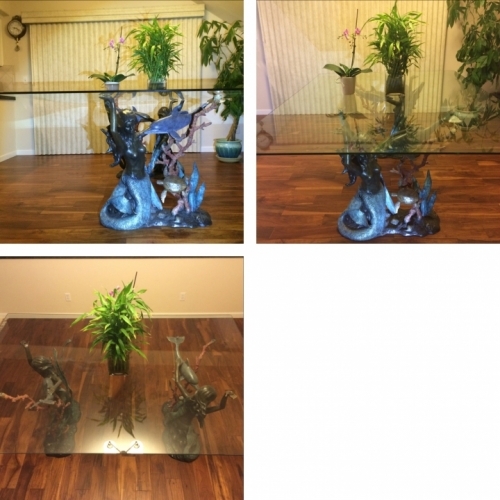 Below Cost..Plus Free $750.00 Glass Top Just arrange for pick-up and pay the freight). Save Tons from list price! These stunning dual "Sculpture" table bases are cast using the "lost wax" process. This is the most precise metal casting technique in existence, ensuring accurate reproduction of the original "masterpiece" and exquisite detail. "Lost wax" casting dates back thousands of years. While modern methods and materials have improved the technique, it is still an extremely labor intensive and expensive process. A staple of contemporary style and elegance for dolphin lovers!! The "dual" pedestal table bases are created using only the best bronze and brass, and hand painted by our artisans insuring each sculpture is matching and yet still "unique" in and of itself (no two are exactly alike). An attractive brass coral reef leads up to the gorgeous serene dolphins. These pieces show three-dimensional quality of dolphins, sea turtles and the marine world. It is as if you are "looking down into the clear ocean waters while dining". Each base dimension: 40 inches W. x 31 inches H. x 18 inches D.